VETgirl wants to give a HUGE shout out to Zoetis for sponsoring a FREE "Facebook LIVE: Canine Leptospirosis (Method of Delivery: Non-Interactive Online)"
This program 785-32863 is approved by the AAVSB RACE to offer a total of 0.5 CE Credits being available to any one veterinarian: and/or 0.5 Veterinary Technician CE Credit. This RACE approval is for the subject matter categories of: Category One: Scientific using the delivery method of Seminar/Lecture Interactive-Distance/Non-Interactive-Distance. This approval is valid in jurisdictions which recognize AAVSB RACE; however, participants are responsible for ascertaining each board's CE requirements. RACE does not "accredit" or "endorse" or "certify" any program or person, nor does RACE approval validate the content of the program. I watched the CE today and I was hoping to take the quiz in order to obtain my CE. I cannot however work out how to do the quiz? 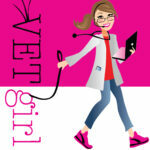 Hi Victoria – the quiz is available for VETgirl members only. Thanks! Regarding the question about initial vaccine series’ interval (discussed at the end of the webinar) — did Dr. Moore say it should be OK to have 2nd injection done w/in 60 days of the 1st? I’m a little confused b/c at the very end, he mentioned 30? days? ?